By Jessica Wohl . Published on April 01, 2019. At first blush, White Castle and vegetarians hardly go together like Harold and Kumar. But marketing at the hamburger chain was actually run by a vegetarian for an entire year. Chief Marketing Officer Kim Bartley embraced the plant lifestyle as a way to get a better handle on how the fast-feeder, long known for its ground-beef sliders, could adapt to a world where people are shunning meat more often, even if they're not completely giving it up. Bartley says her year as a vegetarian (she went back to eating meat in February 2018) was eye-opening. "I was able to see a customer in a very different light," she says. "I observed and experienced how hard it is, especially in fast-food restaurants, to have an option that wasn't basically the same thing all the time." Adding variety has emerged as a major trend at restaurants and in the larger food industry, as brands seek loyalty from a growing number of "flexitarians," those who have strong vegetarian tendencies but also mix in meat or fish on occasion. On Monday, Burger King became the latest chain to join the plant-based party, announcing a limited test of the Impossible Whopper at about 60 restaurants in the St. Louis area. 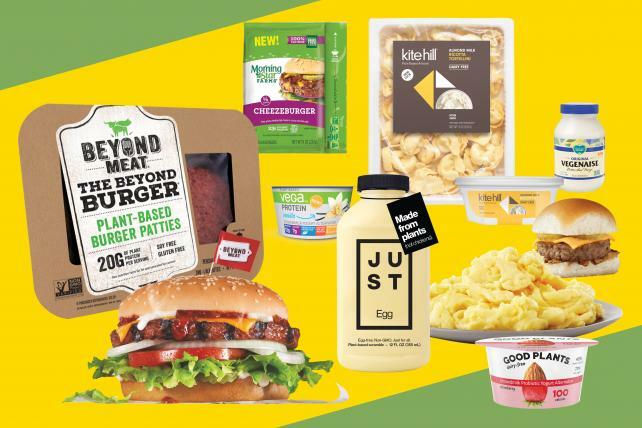 The shift has given rise to new products from the likes of Impossible Foods and Beyond Meat, whose plant-based patties mimic the taste and texture of beef but are made without any ingredients that come from animals. Both are finding their way onto the menus of chains where meatless burgers would have seemed like an enemy just a few years ago. "Successful brands are the ones that are thinking about modern food culture and this compelling desire on the part of consumers to have real foods that don't seem overly processed or produced," says Laurie Demeritt, CEO of the Hartman Group, a food culture consultancy. Plant-based products are hot, even though the vast majority of Americans continue to eat meat. According to Euromonitor International, U.S. retail sales of fresh meat, including beef, veal, poultry and pork, rose from nearly $73.3 billion in 2013 to nearly $78.5 billion in 2018. 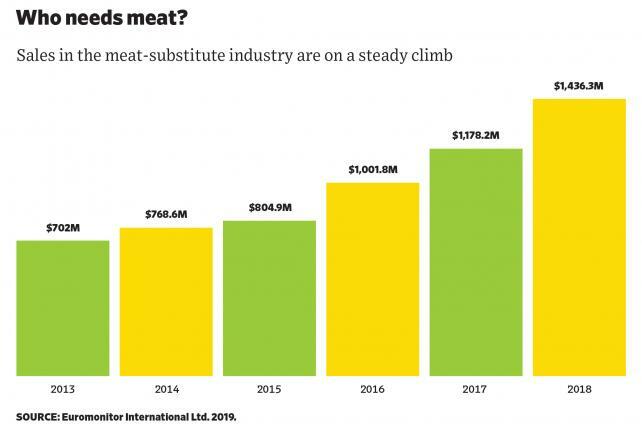 Meat substitute sales more than doubled during that time to a comparatively small $1.4 billion in 2018, Euromonitor found. Even so, the percentage of people who identify as vegetarians or vegans is relatively unchanged over the past few years. (Vegan means avoiding all animal products, including dairy.) In a 2018 Gallup poll, 5 percent of people said they were vegetarians, unchanged from 2012. In the same poll, 3 percent said they were vegans, up from 2 percent in 2012. The rise of flexitarianism is inspiring the sheer number of meatless innovations hitting the market. In 2018, just months after Bartley completed her vegetarian detour, White Castle began selling the Impossible Slider, which includes a plant-based patty from Impossible Foods. A pilot that began at 140 locations in April was so successful that the Impossible Slider hit all of the chain's 377 locations in September. "We're not looking at this as just vegans and vegetarians," she says. "We're looking at an entire diet shift that we saw occurring." Marketing spending for plant-based foods so far is relatively small and driven mainly by PR. Beyond Meat generates lots of buzz through its ties to celebrity investors including Leonardo DiCaprio. When it filed to go public in November, Beyond Meat cited 7.5 billion earned media impressions in the first nine months of 2018, up from 4 billion in all of 2017. It also pointed to the exposure generated by a campaign from A&W Canada, which sells the Beyond Burger and is that nation's No. 2 burger chain. Competitor Impossible Foods has been promoted by the likes of celebrity chef David Chang and the hip-hop collective Wu-Tang Clan, and gets its name on the menus at chains such as The Cheesecake Factory that sell its meatless patties. Carl's Jr. began selling plant-based patties from Beyond Meat late last year in a sandwich called the Beyond Famous Star. The name is a deliberate play on its signature Famous Star, which features a charbroiled beef patty. A campaign that began in February includes a TV ad showing an older cowboy character doing yoga on the beach and interrupting poses to share the plant-based burger with fellow classmates. Weeks later, Beyond Meat began running its own campaign with online videos featuring investor, brand ambassador and NBA star Kyrie Irving. Carl's Jr.'s Beyond burger "is about driving visits with new consumers and introducing our brand to those consumers," says Senior VP of Brand Marketing Patty Trevino, noting that it already has been added to the chain's core menu. The Beyond Famous Star has "great momentum" in a lot of the chain's California markets, she says, but is "bringing in new consumers everywhere," even in places like Oklahoma, where livestock is big business. While the fast-food menu additions are geared toward people who are reducing the amount of animal-based foods they consume, brands should avoid the "flexitarian" jargon, Demeritt says. "Flexitarian is very much an industry term. 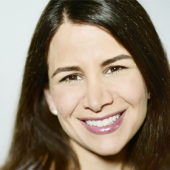 We rarely, if ever, hear consumers describe themselves that way." Instead, marketers should be transparent about ingredients, without getting preachy, Demeritt advises. While pure vegans remain a small part of the total consumer market, their ranks are growing. Gallup says the percentage of vegans jumped 50 percent in six years. That explains why the word "plant" is very much in vogue. In March, Chipotle announced "Plant-Powered" Lifestyle Bowls to make it easier for diners to find vegan and vegetarian options online. The push highlights ingredients such as Sofritas, a vegan protein made from soybeans and spices that's been on Chipotle's menu since 2014. Vegetarian and vegan meals made up about 12 percent of Chipotle's total meals sold in 2018, holding steady with the prior year. Even companies that have catered to vegans for years are finding new ways into the conversation. Kellogg-owned MorningStar Farms aims to make its entire lineup of packaged foods vegan by 2021, up from roughly 50 percent of the vegetarian brand's products today. In March, the brand introduced a "Cheezeburger" that adds plant-based cheddar "cheeze" to its vegan Meat Lovers patty. Just Inc., the company founded as Hampton Creek, which sells products such as vegan Just Mayo, is busy promoting its newest product, Just Egg, an imitation egg made from plants. The brand hosted breakfast taco bars at four events at this year's SXSW Festival, including the Boozy Brunch for a Better World, which, along with Just Egg, promoted brands such as Beyond Meat and vegan cheese maker Miyoko's Creamery. Even Tyson Foods, best known for meat and poultry, is placing a big bet on the rise of plant-based foods. It plans to announce new products in what it's calling "the alternative protein space" soon, CEO Noel White teased during a February conference call. The company has also taken financial stakes in Beyond Meat as well as Memphis Meats and Future Meat Technologies, which are both working on meat produced directly from animal cells. The meatless innovations are aimed at people like Ken Erke, who went vegan along with his wife after watching the documentary "What the Health," which claims that diets filled with animal products can lead to health issues and promotes going vegan. "We were already off of milk, we were already into almond milk for years, but we were still eating dairy-based cheese and loving it," Erke says. "Charcuterie plates were a mainstay in our lives." Going vegan in 2017 was challenging at first, he admits. "It was a total reset," says Erke, who founded Chicago-based boutique agency Major Behavior that same year. But now he knows exactly which restaurants offer protein-packed options, such as the Impossible Burger patties at Umami Burger or M Burger. Erke admits he misses real charcuterie plates but says Treeline's nut-based cheeses provide a good alternative to dairy cheeses. Plus, the packaging has an artisanal look and highlights attributes such as being free from dairy, gluten and soy. For pasta nights, there are more options hitting the market. "Kite Hill was smart to make a ricotta and move into the filled-pasta category," says Erke, who also appreciates that Gotham Greens sells a ready-made parmesan-free pesto. Beyond Meat's sausage, he says, was a game-changer for barbecues; on pizza night, even carnivorous friends have enjoyed pizza made with cashew sauce. "I'm no longer this weird outsider," he says. But for brands looking to gain loyalty from vegetarians and flexitarians, there's more work to be done. "Chain restaurants are terrible," is the gut reaction from Victoria Slone, a certified personal trainer and nutritionist who has been vegetarian for 26 years and vegan for six of those. "In this day and age you'd think they'd have better options. I just have to get creative and usually make up meals myself by omitting certain things from whatever I'm ordering." Still, she is finding a wider variety of options these days, such as Chipotle's Sofritas, Au Bon Pain soups and chili, and vegetarian-friendly dishes at Noodles & Company. While she hasn't tried White Castle's Impossible Slider yet, she's had the Impossible patty at Kuma's Corner and Old Irving Brewery Co. in Chicago, and says it's "amazing, probably the most meat-tasting vegan patty I've ever had. Even smells like it." At Slone's Chicago home, Beyond Meat's products, Vega plant-based yogurt and Daiya cheeses are some of her staples. She says she has even converted non-vegan family and friends to vegan mayo Vegenaise. Some of her highest praise these days goes to Aldi, which has added vegan products including "meatballs" to its lineup. "It's exciting to get foods at a fraction of the cost of Whole Foods," she says. Speaking of cheap eats, White Castle plans to keep Impossible Sliders on the menu for at least the rest of this year, says Bartley. To date, the product has mainly been marketed through social media, but there are plans for a more traditional approach later this year, she says. The chain is even considering adding a vegan cheese to the menu. "That was probably the No. 1 request we had from vegans and vegetarians," says Bartley. An updated version of the Impossible Slider introduced in January has a texture and flavor that mimics beef better than its predecessor, or at least so say some diners who, on social media, have wondered whether they were mistakenly served regular sliders. "Finally got to try the Impossible Burger at White Castle and oh my god I swore they got my order wrong and actually gave me beef it's crazy," one person tweeted.